I thought you were only a veterans cemetery? Are burial vaults required by state law? I have grave space there and now wish to be cremated? Why do you not offer upright monuments? We heard you can’t bring flowers and are very restrictive? What isn’t allowed and why? Do you sell flowers at the park? Q: I thought you were only a Veterans Cemetery? A: Although we do have many Veteran Gardens and still offer free burial space to Veterans, we are a private non-denominational cemetery serving all. A: No. But they are required by WCMP and most active cemeteries. The purpose of the burial vault is to protect the casket from the weight of the earth and the equipment used in the maintenance of the cemetery grounds. Burial vaults also maintain the beauty of the cemetery by eliminating soil settlement. Back in the old days graves would be left in a mound to let the ground settle over time, and in these old cemeteries you can see the pattern of the uneven grounds. A: Cremation is growing more and more popular for many reasons. They can be more affordable, more flexible options, more environmentally friendly. Catholic faith did not recognize cremation until Vatican II in 1965, so that has taken some time as well for minds to change. Many people do not realize that we bury cremated remains weekly into the ground in spaces that were originally purchased for traditional burial. We also have new options for ground burial as well as above ground “Cremation Niches” that ground burial plots can be transferred into. Q: Why do you not offer upright monuments? A: We originally opened to only bronze flat markers in traditional “Memorial Park” ideals. We continually look for ways to improve and modify the park, the ability to place upright monuments might change. Q: We heard you can’t bring flowers and are very restrictive? A: While we do not allow planting of any kind, most people are surprised to learn that we aren’t so restrictive after all. Fresh cut flowers are always allowed. Most markers have their own vase unit attached, these vases are inverted into the ground when not in use. You never need any permission to leave fresh flowers in the vase, or if one isn’t on the marker, we have temporary vases at the office. Potted plants / special arrangements can also be placed with special identification tags from the office. Q: What isn’t allowed and why? 1. Glass Items: These items can easily break leaving glass shards hidden in the grass and cut people. It can also tear through tires and maintenance equipment and make a big mess of the grounds. 2. Balloons and especially Mylar Balloons: Look up online how hot asphalt can get in the summer and think about a balloon melting onto the tar. That is exactly what happens to the bronze markers so when a balloon loses its helium it melts right to the marker. The strings will also get caught in and damage mowing and trimming equipment. 3. Rocks, metal, sharp objects: Anything you wouldn’t leave on the hood of your car, wouldn’t be something you would want next to a marker. Besides scraping up and damaging the markers, they also can get caught in the equipment and shot out of a lawn mower like a bullet. Q: Do you sell flowers at the park? A: Yes. 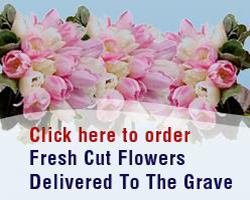 You may now order flowers direct from our site for those interred in the park. We will process the order and then send a digital photo of the flowers after they are delivered to the site. You can then use this photo for the website photo album if so desired. We also have certain holidays and times of the year we have flowers for sale in the office. And in the summer months there are designated areas in the park where you can pick flowers for the graves.